Info "Think of this as a trust exercise..."
SHHHHHHH! is one of the Job Center's microgames in WarioWare: D.I.Y. In this game, the player has to write a secret that Wario tells. 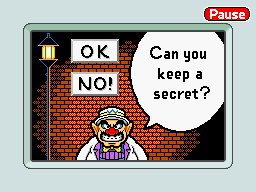 To win the game, the only thing the player has to do is to tap "OK" when Wario says "Can you keep a secret?". Then the secret that the player wrote is told by Wario. If they player says "No!" Wario answers saying "Fine, be that way!" and the player loses the game. "This one's not really a game--more like a way to leave a message for someone. You gotta get'em to play it, though!" This page was last edited on July 19, 2018, at 10:08.